When John Bristow Wornall moved to Missouri with his family in 1843, they purchased approximately 500 acres of land from John Calvin McCoy, the founder of Westport. This original farmland stretched from modern day 59th Street to 67th Street and from Main Street to State Line. Since Missouri was the most western state at this time, this means the Wornalls literally moved to the edge of the United States. The current brick homestead was built in 1858 by John Wornall and his second wife Eliza Johnson Wornall. This house was erected about 200 feet east of the original homestead purchased in 1843 which was a simple one-story log cabin. The original homestead was torn down sometime after 1900 and would have been located near the corner of what is now 61st and Wornall road, across the street from the museum. John Wornall made his living selling his crops to wagon trains heading west on the Santa Fe and Oregon Trails. A portion of the Santa Fe Trail followed the current path of Wornall Road and would have passed directly in front of the house. The barn stood at what is now 63rd St and Brookside Boulevard. After the Battle of Westport and the murder of John Wornall’s father-in-law Rev. Thomas Johnson, John moved his family to a house on 9th and Main in downtown Kansas City which they had purchased during the year of Order No. 11. While living there, his second wife Eliza passed and he married his third wife Roma Johnson Wornall. After John’s term as Missouri State Senator, he and Roma returned to the Wornall House in 1874, and according to Frank, the eldest son of John and Eliza, they lived there for 13 years. John bought a home at 910 Locust in Kansas City in the fall of 1869. The family lived in both houses and John Wornall Jr. attended Border Star School for a time. John also purchased a home on the southwest corner of 39th and Baltimore. After John Wornall’s death in 1892 in this new house, Roma moved in to the Wornall House full time. Roma sold the farm and the house in 1910 to J.C. Nichols, who was in the process of developing what is now The Plaza. Nichols in turned allowed the Pembroke Country Day School for Boys to use the home as the first site for their school. However, after living for a year in an apartment around 35th and Main, Roma wished to move back to the country. The contract of sale with J.C. Nichols allowed her to repurchase the homestead, so she returned. She lived here until her death in 1933. Her son, John Jr. lived in the home until his death in 1962. After his death, the home was sold by the family to the Jackson County Historical Society and over the next several years was restored and opened to the public in 1972. In the 1990’s, The John Wornall House Museum became autonomous. 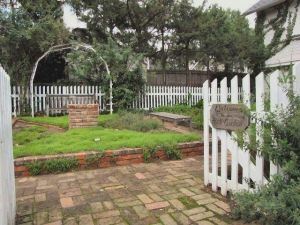 The grounds of the John Wornall House Museum, although only a fraction of John’s original property, are very beautiful and open to the public. There are picnic tables on which to enjoy lunch and a path that leads around the house. 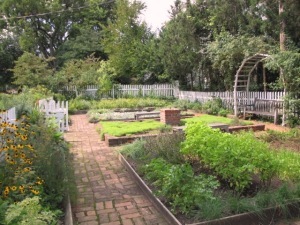 An herb garden on the north side of the house contains many of the herbs that Eliza Johnson Wornall would have grown while she lived here. The garden is maintained by the gracious work of the Master Gardeners of Kansas City and is free and open to the public.